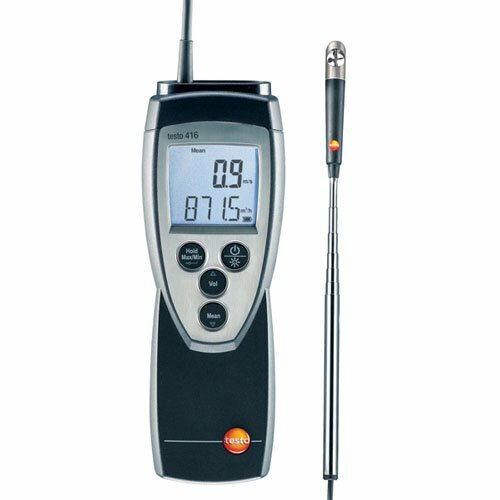 The compact Testo 416 is an easy to use vane anemometer with attached 16 mm (0.63 in) vane probe on a telescoping shaft. Just enter the duct area measurements directly into the Testo 416 and volume flow measurements (cfm) are shown on the clear display. Timed and multi-point mean flow calculations allow quick, easy and accurate airflow measurement. Min-Max values are one button simple, while the "Hold" function freezes the current readings in the display for easy data recording. Dimensions 7" x 2.5" x 1.6"